For most bloggers, just getting people to read our posts is an exciting step. Receiving comments from readers, even cooler. But how do we respond to comments on our blogs, both positive and negative .. and should we respond at all? Ideally, of course, we want our blog visitors to be thrilled with what we wrote and have nothing but positive things to say about it. In these cases, readers may be congratulatory, encouraging, or grateful … or, better yet, they’ll offer additional insight that further generates conversation and draws other readers in. These are the readers that add value to what we do, and we want them to keep coming back. To these readers, show your appreciation. Thank them for their comments, and offer reciprocal thoughts (if necessary) to show that you care as much about what they have to say as they do about what you said. Your blog readers may often have questions for you: questions about your products and services, follow-up questions clarifying something you said in your post, or further thoughts on the post's topic. All of these are great and are a sign of your readers' interest in what you have to say. Even if you don’t have an answer yet, respond to your commenter to let him know that you heard his question and will be forthcoming with a response soon. You can also use this opportunity to solicit answers from other readers; perhaps they can offer insight that you couldn't. The thing about the web is, you’re going to disagree with someone sooner or later. Even when you tailor your blog posts and proofread a million times to make sure you’re not going to offend anyone, things can go wrong. Your words can be taken out of context, and, well, someone just might think you’re dumb as dirt. And that’s okay. You just have to be sure not to retaliate with further negativity. It’s up to you to steer the conversation in a positive direction. 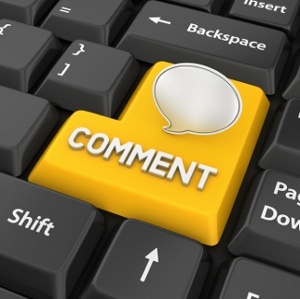 Negativity from a commenter doesn’t have to lead to negativity from the blogger (that’s you). And don’t judge, no matter how angry you are or how badly you’d like to mar your commenter’s reputation after what he did to yours. “An eye for an eye” doesn’t exactly work on the web. Don't be afraid to delete inflammatory and offensive comments. Your true readers will probably thank you for it. Spam comments in particular need to go. If you don't have an anti-spam solution set up yet for your blog, it's probably time to start looking into the options. Regardless of the type of comment, don’t wait to respond. Chances are, most of your readers subscribe to your RSS feed or newsletter and therefore read your posts as soon as they’re released. Don’t assume that once your post is live, your work is done. Your job as a blogger is to create an environment that encourages conversation … and conversations require participation from two parties: you and your audience. And remember, once it’s out there, it’s out there. So, before you curse your aggressors or make promises you can’t keep, take a step back and review the situation as an outside observer. Interested in starting your own company blog, but not sure where to begin? We can help!